I also got a pumpkin stamp. I just saw this little stamp and thought I had to have it!! 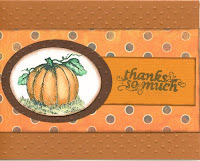 I know it is out of season right now but at least I will have a nice fall thank you card when the time comes! The "thanks so much" is a Studio G stamp. Oh the pumpkin stamp is Hero Art I do believe *NO I am NOT going to walk over there and see! * I used the Cuttlebug swiss dots folder on the card base and also on the brown oval. No Stickles on this one but I did use some Chestnut Cat Eye Ink for the distressing. could you tell me what your trusty colored pencils and Odorless Mineral Spirits method is? The method is where you color along the outline with the color pencil and then use a blending stump dipped in OMS and pull the color out in circular motions. Just do a search on YOUTUBE for gamsol and there will be videos pop up to show you. VERY EASY TO DO! !